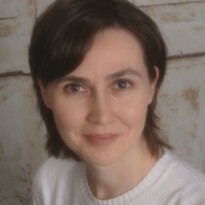 Author of The Coldest Heart, a YA paranormal romance about a girl who loves her boyfriend very much, but when the two of them get in trouble with the all-powerful Queen of New York, she wonders if he has her best interests at heart. Would You Rather Be a Dog or a Bird? 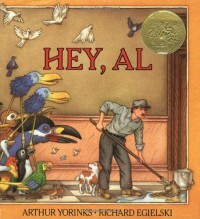 Hey, Al is one of the weirdest kid books I’ve ever read. The plot goes as follows: a man named Al lives in NYC with his trusty dog Eddie. Al works as a janitor, but is not happy because being a janitor is a difficult, underpaid, and cheerless job. So when a gigantic bird flies into his window and offers to carry him to a paradise island, Al grabs Eddie, and off they go to sunny beaches, loads of tropical fruit, and incessant parades of colorful birds. Yes, they love it on the island. Unfortunately, in the tradition of Pinocchio, Al and Eddie start turning into birds. So they cut and run back to NYC, where instead of hating their dreary life, they try to enjoy it because at least they are not birds. Also, Al paints his apartment a more cheerful color. The end. Now, the book is clearly a cautionary tale/allegory about taking drugs. You take them—you lose yourself and become someone or something else. And that’s all good, but how much would a kid understand? For him/her, it would be just a story about a dude not wanting to be a bird on a paradise island. And okay, perhaps even for a small child, being a human has its value, but what about Al’s dog? The dog literally does not want to turn into a bird because…I don’t know…it’s better to be a dog? Would that make sense to a kid? Also, not to go all PETA on Arthur Yorinks, but how did Eddie get into drugs?